There seems to be an unlimited number of ways to make money online these days. With so many different products and services to be affiliated with, how do we find a product/service that will convert well and be profitable? One of the easiest ways to make money online is by promoting free products, such as magazine subscriptions or software trials. Just because a product is free does not mean there is no money to be made! Free products might also include things such as white papers, magazine subscriptions, or software. Depending on the product, a free product may convert better than a paid product. 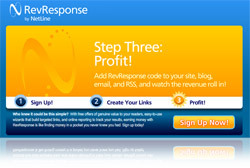 RevResponse is a new company that allows bloggers and affiliate marketers to provide their readers and audience with informative niche-specific resources. The best part is that you can earn up to $20 for each payout. RevResponse allows publishers from all over the world to promote free product and earn money – you are not required to be a U.S. citizen. RevResponse pays its publishers via PayPal, but only 45 days after the end of the month in which the revenue was made. It would be nice if they paid out sooner than that. Traditionally, the problem with monetizing widgets has been that even though they can be useful to readers, they do not produce any ROI. 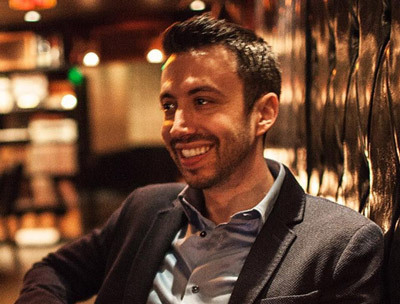 RevResponse aims to solve the problem with widget monetization by giving allowing publishers to provide informative materials while earning money. RevResponse also allows you to display offers on a page which matches the brand and colors of your blog. You can see an example of my customized RevResponse page here. Once you have been accepted into the RevResponse program, you can create interactive widgets for your blog in a few clicks. 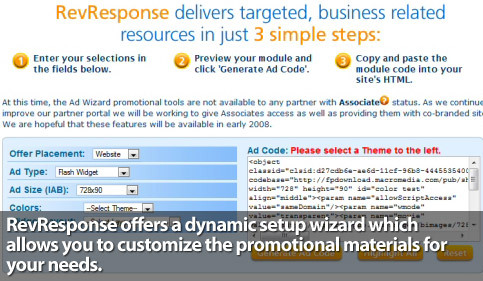 RevResponse offers a dynamic setup wizard which allows you to customize the promotional materials for your needs. You can then copy and paste the advertising code onto your site. RevResponse strongly believes in doing whatever it takes to further open up the lines of communication between publishers, advertisers, and Account Managers. The RevResponse forum allows you to network with other publishers and learn what has and hasn’t worked for them. If you have a question or want to make a suggestion, you can post it in the forum. One thing I have been particularly impressed with about RevResponse is their professionalism and how quick they are to respond to my emails. RevResponse believes in taking the good with the bad in effort to continually improve their program. In addition, if you wish for a more one-on-one experience, each RevResponse publisher is assigned an Account Manager. Although RevResponse is new on the scene, it looks like they already established a dedicated community of bloggers and affiliate marketers. 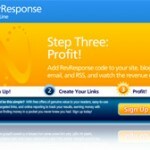 With an interactive widget creation tool, a wide variety of promotional methods, and a knowledgeable community, RevResponse appears to be a viable option for those interested in making money online. This looks interesting. These are like magazine subscriptions right? I’ve signed up for a few free IT trade publications in the past, but never realized it could be an affiliate type of revenue as well. I just assumed, that since I never paid for it, there was no affiliate money in it. I’ll be looking for some related to my site visitors. Nice review…This is my first time hearing about RevResponse and I think I must try it. Never heard about Rev Response before, so thanks for the info and the review. Sorry forgot to add: keep us informed about how it pans out too. Sounds good to me. keep us posted on how it works out for you . A really useful post after a long time Nate. Sounds interesting and worth a try. Shall do so and keep this site informed. Your customized page for revresponse is quite nice and very inspiring. Congratulations. Those are some great pix in the side bar, i visited flikr where you put them up. Are they from around where you live? Looks like very spectacular country there! This is the first I have heard about this platform. I’ll be sure to try that one on my blog. Thanks for reviewing the system too. @Nicole – yes those pics were taken 5 minutes from my house/office in an area called Pinnacle Peak. It is a very beautiful part of Arizona. It’s look like a way to paradise, wonderful shot this is Nate. sounds good to me, worth a look. This explains why I keep seeing those little magazine subscription widgets everywhere. Sounds like it could be a decent way to earn money, though. You are lucky to live in such a picturesque location. It looks stark and rugged but beautiful for all that! Thanks for the heads up. I never thought about giving away free products and earning money from it. I will give it a try. Sounds good, lets gonna look at it. Will be going to check them out, or go and see what is happening on RevResponse forum. Previous Previous post: What Is The Benefit of Social Networking?